I’m not sure there is a more tragic portion of Scripture than what we have in 2 Samuel 11. Most of us, even if we don’t spend a lot of time in the Bible know this story. David, one of the most loved and celebrated men in the history of Israel committed one of the most disgusting acts that we can imagine. This act I am referring to is his sin with Bathsheba, and the ensuing murder of her husband to cover up his sin. The Bible says that, “In the spring of the year, the time when kings go out to battle, David sent Joab, and his servants with him, and all Israel. And they ravaged the Ammonites and besieged Rabbah. But David remained at Jerusalem.” This is an important detail that we might be quick to just pass over. As the stage is set for the Bible to relay the story of David and Bathsheba to us, we see that David should have never been in position to commit this sin, he was supposed to be out in battle with his men. David however has grown complacent, and instead is at home while his men go out and fight his battles. This is an important detail for us, and the point in which I want to make. I’m writing today, not so much to talk about the tragic case of David and his sin, but I want to write about the nature of sin, and the danger of sin. I’m not writing just about David’s sin, but our sin as well. Sin tends to snowball. One sin leads to another sin. In order to avoid the consequences of one sin we have to commit another sin to cover it up. Our sin ends up not simply impacting us, but the people around us. Very often, it isn’t only ourselves that suffer for sin, but those around us as well. David’s very first sin in this scenario, is as I said slothfulness. He was supposed to be in battle with his men, yet he stayed behind. The next sin we see David committing is lust. David takes a stroll on his roof and he sees Bathsheba, a beautiful woman bathing. David then sent and inquired about the woman and discovered that she was the wife of Uriah the Hittite. One would think that a righteous man such as David, in whom we’ve seen God work so mightily throughout the Bible up to this point would then back away from the situation. Certainly an upstanding man such as King David wouldn’t pursue this relationship any further. Sadly, this isn’t the case. David sends for Bathsheba and he commits adultery with her. Sometime later, Bathsheba informs David that she is with child. In order to cover up his sin, David sends for Uriah and makes several attempts to get the husband of Bathsheba to sleep with his wife. Uriah, being more righteous than David refuses to do so. He refuses to eat and drink and lie with his wife while the other soldiers are in battle. When David can think of no other way to cover up his sin, he sends word to put Uriah on the front lines of battle, then for the other men to fall back. To put it plainly, David has Uriah murdered. David then takes Bathsheba as his own wife. Usually when we talk about the heroes of the Bible, we don’t associate a sequence of events like this with their lives. If we had only studied the life of David up to this point, and knew nothing of this story before now…we would be in utter shock! But the Bible is very clear about sin, even the sins of those whom God in his providence chose to use in mighty ways. The Bible is very clear about the nature of sin. Sin is dangerous, sin is evil, and even the best of us are not immune to its disastrous effects and consequences. This window into the life of David is a powerful reminder for us all. When we crack the door, even a little bit and let sin into our lives we have no idea how tragic the results can be. In David’s own life, what started out as sloth and complacence gave way to lust, which gave way to adultery, which gave way to murder. As a result of David’s sin a righteous man died. But not only did David’s sin cost Uriah his life, but several other of David’s men died. We know from further reading in 2 Samuel that the child whom was conceived as a result of David’s sin also died. Again, David’s sin had tragic consequences that were far reaching. The depths of sin and the consequences of sin were far beyond anything that David could have imagined. Truthfully though, this isn’t just true of David’s sin, it is also true of our sin. It is very rare that our sin impacts only us. Very often when we allow sin to take root in our lives, the end results are far reaching. As parents our sin affects our children. As husbands our sin affects our wives, and vice versa. The sins of children affect their parents – and we could keep going, but I think we get the idea. Sin is indeed tragic, and left to itself it kills and leaves a path of destruction in its wake. God’s forgiveness ultimately comes through Jesus Christ, the “Son of David” who willingly took upon himself the tragic consequences of our sin so that we wouldn’t have to. This is good news for us all. Again, if David can fall victim to the tragedy of sin, no one is immune. So, no matter where you are today, no matter what you’ve done, you have hope in Christ. Turn to him today and ask him to take your sins away and to pour out his mercy upon you. Life is hard. I think most of us can agree with this statement. Certainly there is much beauty that surrounds us, but the undeniable truth is that life is also quite the struggle. Most of us spend our days either ignoring these struggles, or simply trying to avoid them.We just have to grin and bear it, and eventually we will be able to move past the struggle, and once again we will be see the beauty. The beauty is what we are after, but the struggle seems to be where we often find ourselves. Two things are on my mind this morning. Now, perhaps we can give Adam and Eve a pass. They’d never sinned before, so perhaps they didn’t have that great a grasp on the mercy of God. Perhaps they didn’t fully understand how this grace thing worked. We don’t have this excuse. We’ve been seeing people sin for quite a while. We’ve only lived in the midst of sinners. In fact, all we’ve ever been is sinners. Yet, we’ve also seen grace in action, especially in the person of Christ. And this takes me to my last point. Perhaps the struggle is the point. Perhaps the struggle is the beauty of it all. There is nothing more beautiful than the love, mercy, and grace of God. This is never more evident than in the midst of trying times. It might take us a while to see it, but once we are able to re-center and refocus ourselves on God we know this to be true. Apart from these struggles we could never know the the mercies of God, at least not in any experiential way. This is true in speaking of sin, sickness, or even death. It’s even true when the kids are driving you nuts or the drive-thru is slower than it should be. So, perhaps the struggles are there to point us to God. Maybe, just maybe, the struggle isn’t the opposite of beauty…Maybe, the struggle is all part of the beauty. Just a precursor before I get into this post. There has been a pretty big discussion surrounding a certain well known pastor who has been accused of overemphasizing grace above the law, or maybe it is better to say that the critique of him is that he emphasizes only one aspect of grace while ignoring the progressive sanctification that happens in the life of the Christian. This is not a post about him or his theology. This scenario has certainly got me thinking about these things, but I am not attempting in this post to defend him. This post is also not a theological treatise per se on the relationship between law and grace. I don’t intend to quote tons of scripture, and I am not going to give this subject a full treatment. This is simply what the title of the post says it is. Random thoughts on law and grace. What follows is simply what has been rolling around in my mind, and will now roll off of my fingertips. When I read this, it seems to me Jesus is saying, when we are rightly keeping the Law, this is what it looks like. You are loving God with all that you are, and you are loving your neighbor. It’s simple in theory, but all of us can agree that it’s rather hard in practice. You see, we have that little problem called Sin. This is the beauty of grace. Apart from grace we would never love God. We can’t even understand who God is apart from grace. God in his infinite kindness and mercy reveals to us who he is. He gives us eyes to see Him. 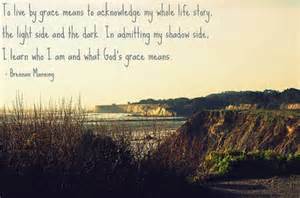 By grace we are able to understand what God did for us through Christ on the cross. What God is still doing in us through the Holy Spirit. Obviously as we continue to see this more and more, and understand it in deeper and deeper ways…Our love and affection for God grows. But it goes even further. The grace of God allows us to love our neighbors, love each other, in ways that we couldn’t before we came to see who God revealed in Christ is. Galatians 5:14 says, “For the whole law is fulfilled in one word: “You shall love your neighbor as yourself.” Further down in Galatians 5 (verses 22-23) Paul talks about the fruits of the Spirit. These fruits are all things we need in order to love our neighbors, and even I would say love God and rightly serve and worship him. So from what I’ve written, what is the relationship between law and grace? Well, it is grace that enables us to keep the law. It is grace that enables us to love God and to love our neighbors…apart from grace it is impossible. But is that it? Well, I now ask myself a question. I am a saved Christian. But do I love God with all that I am? Do I love my neighbor as myself? Sometimes…kind of…sort of…maybe. Most times probably not. So, grace points us to the law, and enables us to keep it. I do believe this. I believe that as we grow in grace, we will continue to get better and better at keeping the law. I believe as we grow in faith, and our love of Jesus deepens, the fruit of the Spirit becomes more and more obvious in our lives…But, I also know myself and other Christians well enough to know that it doesn’t ever get perfect on this side of eternity…So where does this leave us? Well, I see here the purpose of the law. As we see how far we still fall in our keeping of God’s laws and God’s commands, we are pointed again and again to the grace of God. We are pointed straight to Jesus. This is what Paul tells us time and again in Galatians. 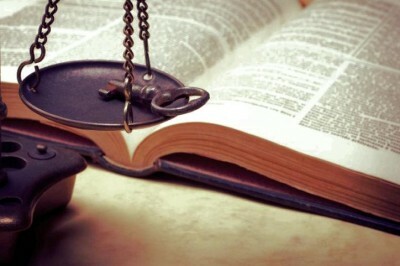 The purpose of the law is to point us to Christ. The law points us to grace. So, I will end things here. I can’t imagine accusing anyone of emphasizing grace too much. I said earlier today via social media that preachers of radical grace have always been accused of not taking the law seriously. These same charges were leveled against both Jesus and Paul. That’s pretty good company in my book. This though, in my estimation is the beauty of the Gospel. As we look at this radical grace of God, as we see the unbelievable mercy revealed to us in Jesus, as we become more and more enamored with grace and the God who has shown it to us…that’s where life change comes from. To preach radical grace isn’t to minimize the law…it is to point us to it. Progressively we do indeed become more and more Christ-like. We do begin to love God more and more. We do indeed love our neighbors in ways we couldn’t before…Romans 8:9-11 tells us this is the way it should be. But, in revealing the law to us, we also continue to see just how far short we fall of God’s standards…even after we’ve received this grace…So we fall right back into the arms of a merciful God…completely dependent upon him for it all. Such rich symbolism-The body of Christ broken, the blood of Christ poured out-for my sin, and the sin of those all around me. We receive the elements, and we receive this grace one more time. Grace imparted, symbolic and very real. 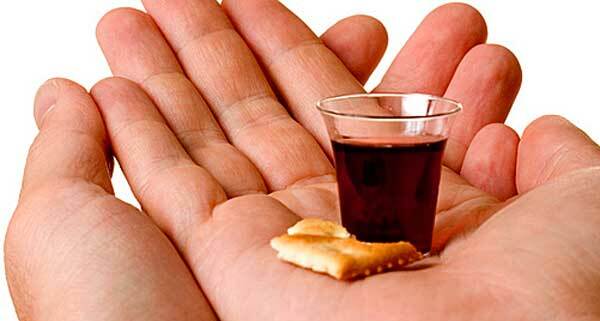 We all see the symbolism within the Lord’s Supper. We understand what the elements represent. We understand, at least to the degree our finite minds can understand, what Christ has done for us. But, I wonder if perhaps many of us are missing one other key symbol contained within this most precious of ceremonies. As we pass the elements, there is a certain clumsiness. There is an uncertainty. There is nervousness and even a bit of quiet and controlled chaos. “Is the gentleman going to bring the plate to me, or do I need to get up and get it?” Even he doesn’t seem too sure of where he is supposed to go. There is space between myself and the person to my right, so I gingerly walk it over, afraid to spill the juice. I slowly pass the cups, she carefully receives them from my hand. This scenario repeats itself time and again throughout the congregation. My 3 year old daughter loudly whispers throughout as I try to shush her, then she finally decides to get up and take off down the aisle. I have to race after her. This clumsiness, this uncertainty, this bit of chaos in the midst of the sacred as we receive the elements is the perfect symbol to represent the way in which we receive Christ. And how powerful it is! We fumble around, so unsure of ourselves. To the naked eye there is nothing elegant, nothing sacred, nothing graceful about it. As we shakily received the cups, so we shakily took hold of Christ himself. In all of our clumsiness and gracelessness we receive the infinite grace of Christ. In spite of all of our uncertainty we can be sure of our place in his kingdom. Thank God it doesn’t depend on us. Thank God our receiving of his grace has nothing to do with the gracefulness or gracelessness with which we receive it. 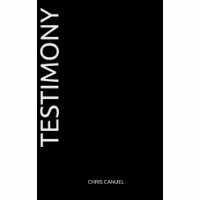 About three years ago I self published a book entitled “Testimony” loosely based on my own personal testimony. I’ll be the first to acknowledge that the writing in the book is far from wonderful. By the grace of God, I’ve grown in both my abilities as a writer, as well as in my knowledge of the faith. Because some of the writing is so raw, I was hesitant to make the book available in the kindle format, as well as do much to publicize it. The more I thought about it though, I decided to put it out there. It does much to show where I was as I began seeking, and it shows the grace of God in his pursuit of his blessed children. Despite the fact that this book won’t win any literary awards, I still enjoy the story and find myself getting sucked in,(Does this make me vain?) and I have received much positive feed back. If you would like to purchase the Kindle edition of “Testimony” for only $2.99 please click here. I pray it will bless you in some small way. Print editions of the book are also available through Amazon. Last night I learned that Brennan Manning had died. I will forever be grateful to Mr. Manning for his writing. I believe I have read his full body of work, some books more than once, and few authors, if any, have helped me understand grace more clearly than Brennan. He was an imperfect man who stumbled and limped through life. He wasn’t what many of us would envision when we think of the ‘victorious Christian’, yet that’s exactly what he was. He got up one more time than he stumbled, and this last time he got up to enter into the arms of his Abba. Brennan Manning knew that he was completely dependent on the grace of God, and the ‘relentless tenderness of Jesus’…Only when you and I realize that too, will we truly be victorious. Very often as I read the writings of Mr. Manning I found myself cringing. I think grace often does that. One would think that as we reflect on the good news of Jesus Christ, and the grace with which he has lavished upon us, we would be quick to embrace it. Far too often though, that isn’t the case. Sometimes grace is just as hard to accept as it is to give. Most times we Christians talk a good game about grace, but in practice we leave much to be desired. This is just as true of ourselves as it is of others. We know God forgives…but does he really forgive like that? God is full of grace, but even when I’ve done this?